How much do Blackhawks suites cost? Prices typically range from $4,500 - $8,500 for Chicago Blackhawks suites. Suite prices will vary based on day of game, opponent, and the location of the suite. Blackhawks suites are more expensive than suites for the Chicago Bulls. Prices for concerts and other events at the United Center can vary widely based on the type of event. The Lower suite level at United Center is located just above the 100 level seating sections. Lower Level luxury suites will include 12 suite tickets and 4 VIP parking passes. Guests will also have the option purchase up to 6 additional tickets if necessary. All United Center suites will include interior/exterior seating, upscale furnishings, HDTVs, WiFi and a dedicated suite attendant. Club Level luxury suites will include 12 suite tickets and 3 VIP parking passes. Guests have the option to purchase up to 8 additional tickets if necessary. Premium in-suite catering options are available to purchase in advance. The Club suite level is considered the lower suite level in the United Center. Penthouse luxury suites will include 14 suite tickets and 4 VIP parking passes. Guests have the option to purchase up to 8 additional tickets if necessary. Premium in-suite catering options are available to purchase in advance. A United Center suite will include a dedicated suite attendant, HDTVs, upscale furnishing, Wi-Fi and interior/exterior seating. The Penthouse suite level is considered the upper suite level in the United Center. To enter all United Center suite levels, use Gate 2 ½ on Madison Street or Gate 6 ½ on Adams Street. Next to each gate entrance there are elevators and stairs that will take you and your guests up to all three suite levels. 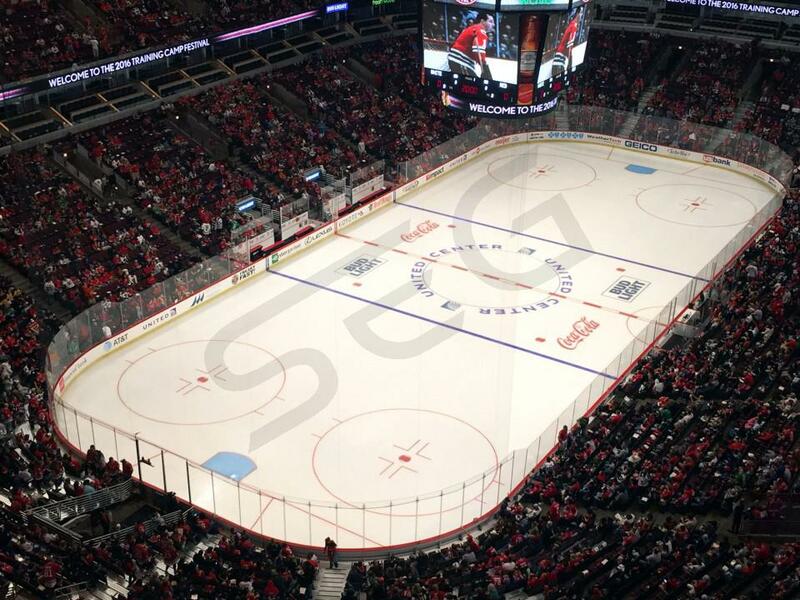 For Bulls and Blackhawks games, the gates usually open 90 minutes before the game begins. All suites come with four parking passes per game. Two of the passes are for Lot C or K, while the other two passes are for Lots A, B, D, E, F, MX, or L. A link to the parking lot map will be helpful upon arrival at United Center. All bags larger than 14”x14”x6” are prohibited in the United Center. Purses and drawstring bags of appropriate size will be permitted in the arena. Please note that all bags will be inspected by security personnel prior to entering the United Center. In-suite catering can be purchased for you and your guests to enjoy while attending your event. Levy Restaurants is the exclusive caterer for all United Center luxury suites, offering a wide variety of deluxe food and beverages. On average, Suite Experience Group clients tend to budget $1,200 for catering at the United Center. There’s no exact answer here. If you’re renting a suite as part of a corporate event, it may be best to wear more formal attire. If you’re attending an event at United Center simply with friends and family, casual attire is more than acceptable. 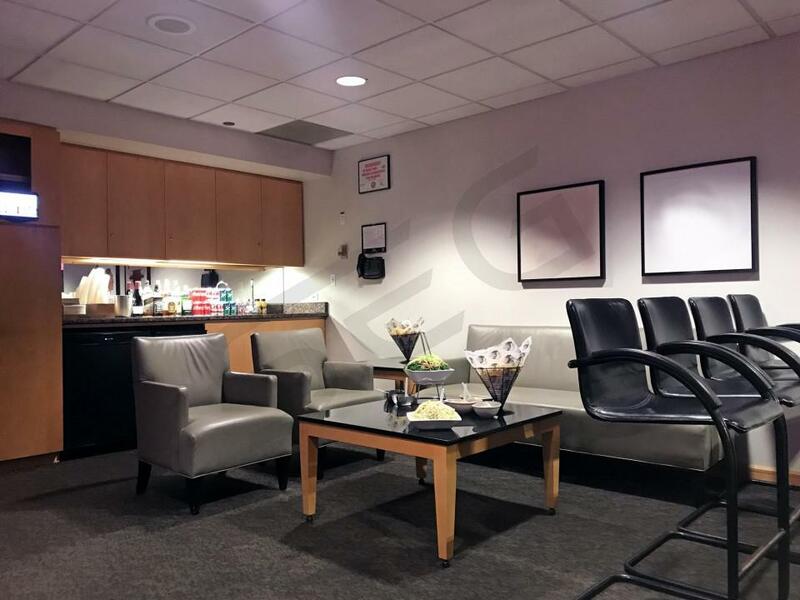 All skyboxes at United Center are climate controlled and have a coat closet for storage. Please visit our general FAQ page or feel free to contact us as we would be happy to assist you. The Chicago Blackhawks come into 2017 looking to again compete for the Stanley Cup, which they have hoisted 3 of the last 7 seasons. They will surely be hungry this year after a surprising first round playoff exit last season despite clinching the Western Conference. Leading the way will be Patrick Kane, 2015-16 NHL MVP and leading scorer, who tied for second in the league last season with 89 points. Kane is a sure fire Hall of Famer, but it doesn't stop there for the Hawks. Captain Jonathan Toews, Defensemen Duncan Keith and Brent Seabrook, and goalie Corey Crawford will look to propel the Blackhawks back into the playoffs. The Hawks made some notable moves in the offseason to bolster their roster. The team was reunited with Brandon Saad, who was vital in the Blackhawk's Stanley Cup runs in 2013 and 2015, by trading dynamic winger Artemi Panarin for Saad and Anton Forsberg, a young goalie prospect. Saad will be a welcomed addition to the roster, as he achieved a plus/minus of +23 last season. GM Stan Bowman also re-signed a fan favorite, sniper Patrick Sharp. In 2017, the Blackhawks will have all eyes on them as they host the Pittsburgh Penguins to kick off their 2017-18 season. The Hawks will also host the Predators, Red Wings, Golden Knights, Sharks, and Blues, and more this season. Known as the "Madhouse on Madison," the United Center is constantly selling out and is a premiere stadium to visit. A private luxury box for the Blackhawks is a great way to entertain clients or watch a game with friends and family. 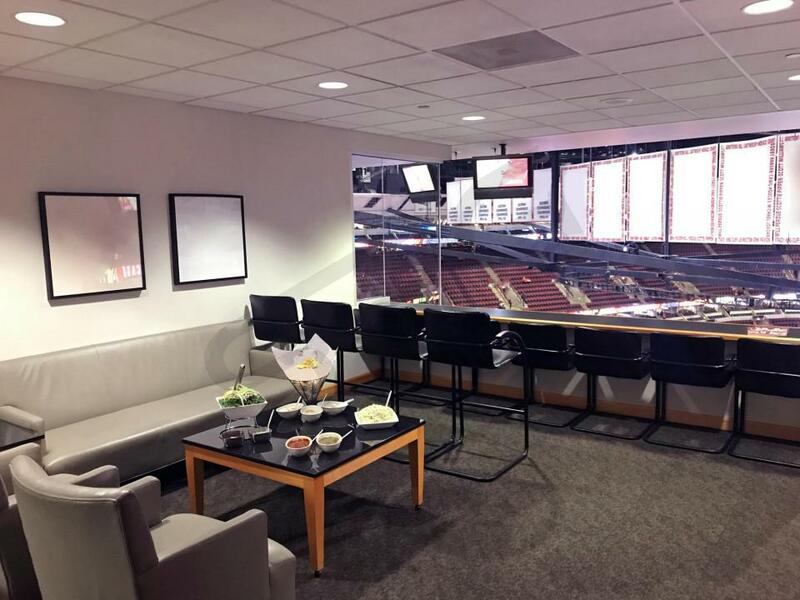 A Blackhawks suite will feature premium in-suite catering options, VIP parking, a dedicated suite attendant, full-service wet bar, HDTVs, upscale furnishing and the most comfortable seating offered at the United Center. 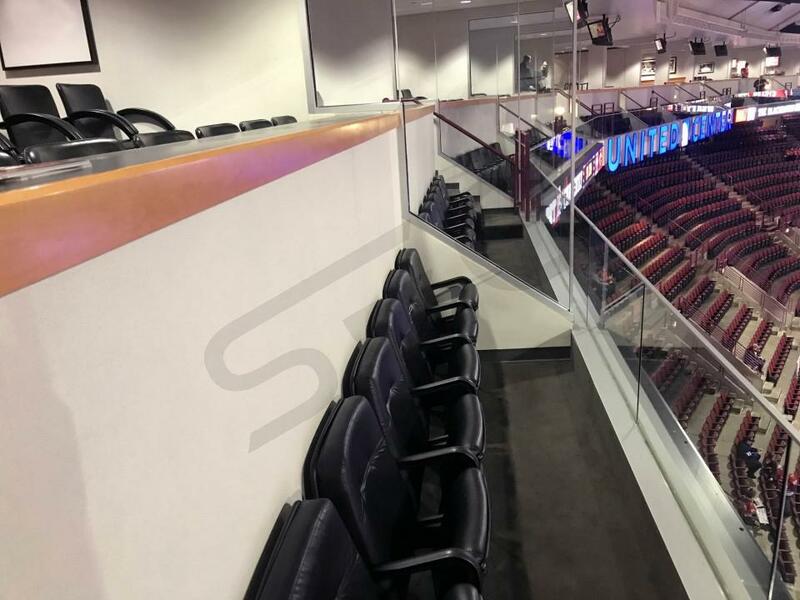 Skyboxes for the Blackhawks can accommodate small or large groups. The Chicago Blackhawks come into 2016 loaded with talent led by one of the best players in the game in right winger Patrick Kane. Kane led the NHL in points and was third in assists on the season while once again making his case for the best player in the NHL. Left wing Artemi Panarin was second on the team with 77 points and complimented Kane perfectly as a finisher and distributor. Center Jonathan Toews was third on the team with 58 points, which came on 28 goals and 30 assists and brought his typical veteran leadership and a great feel for the game. Goalie Corey Crawford was a wall in the net allowing only 2.37 goals scored against per game. In the offseason, the Hawks brought back defenseman and 16-year veteran Brian Campbell. Campbell had the highest plus/minus in the NHL and will surely make a positive impact on Chicago's backline in 2016. In 2016, the Blackhawks will host the Minnesota Wild, St. Louis Blues, Los Angeles Kings, Vancouver Canucks, Detroit Red Wings, San Jose Sharks, Pittsburgh Penguins and the Boston Bruins. Watch the defending Stanley Cup champions in style this season. A private luxury box for the Blackhawks is a great way to entertain clients or watch a game with friends and family. 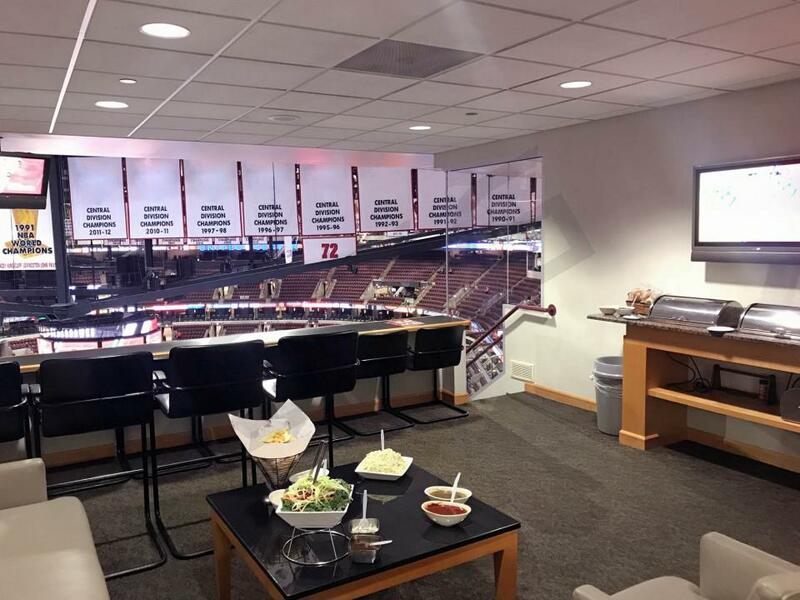 A Blackhawks suite will feature premium in-suite catering options, VIP parking, a dedicated suite attendant, full-service wet bar, HDTVs, upscale furnishing and the most comfortable seating offered at the United Center. Suites for the Blackhawks can accommodate small or large groups. The United Center is also home to the Chicago Bulls and will also be hosting the the Chicago Classic NCAA Basketball Preseason tournament in December. Along with those events, you can also get a suite for Sia with Miguel, Kanye West, Drake & Future, Ringling Brothers Barnum and Bailey, Stevie Nicks, Maxwell & Mary J. Blige, Twenty One Pilots, and Game of Thrones Live. There’s no reason to believe the Chicago Blackhawks won’t make the playoffs for a seventh straight year in 2014-15. They finished last season seventh overall in the NHL and third in the Central Division. A key addition to help the Blackhawks will be center Brad Richards. He’ll join other stars Patrick Kane, Brandon Saad, Patrick Sharp and Jonathan Toews. Head Coach Joel Quennrville proved the Blackhawks have one of the league’s best offenses after finishing second overall in scoring. Watch one of the NHL’s premier teams in the most luxurious way possible. A Chicago Blackhawks luxury suite will feature premium in-suite catering options, VIP parking, dedicated suite attendant, full-service wet bar, HDTVs, upscale furnishing and the most comfortable seating offered in the United Center. A luxury box for the Blackhawks is a great way to entertain clients or watch a game with friends and family. Thank you for signing up for specials at United Center. Enter your email address below to stay in touch. We'll sign you up for our newsletter, which will inform you of the latest inventory and events at United Center. We promise we will never sell or distribute your information. 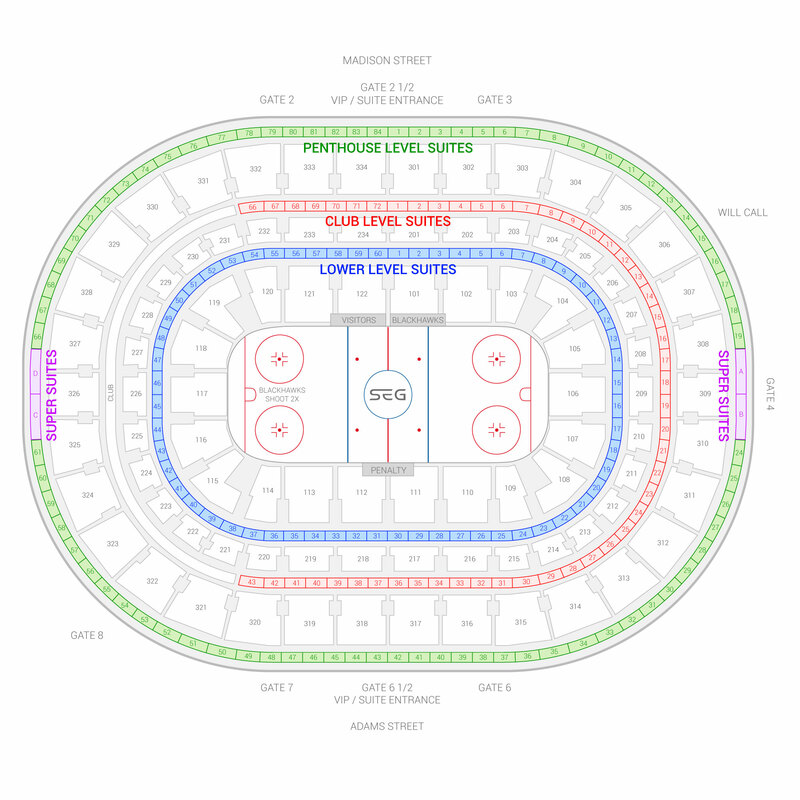 The seating chart below shows where the Chicago Blackhawks suites at United Center are located.